Brown, around 10 cm long. A large scar on the upper left side of his skull, hair no longer grows there. Neutral, doesn’t really express much emotion. Liam is the kind of person who does his very best to hide his emotions and feelings. He hides his emotions and feelings behind what he calls, “Inner Barriers”. These Inner Barriers are what he believes a true leader should have, because he believes that emotion, is one of the primary things that stops a leader from effectively laying out and implementing plans. In addition to these beliefs for leadership, he also strongly believes that a warrior must set aside all emotion and let their body run itself, using instinct and impulse as opposed to thinking. Liam is the type of person who wishes and wants nothing but the very best not just for the Sanctity Treaty, but for all species of the universe. One of his main goals is to unite the galaxy under the banner of the Sanctity Treaty, and allow all species and races to live freely and without hate, poverty and racism. While he tends to think and act without emotion, Liam also tends to avoid combat whenever possible. This is to avoid harm and division within the Sanctity Treaty, but most of all, it is to keep himself alive. So much so that he uses the Sanctity Treaty as a personal shield. This is to the point where Liam will fake relationships. He will often try to weasel his way into another life or society if he feels there is something for him to gain. He does this by faking respect until he has the power to remove or discard what is in his way. After he has gotten what he wants, he will simply leave, without a word or warning. Liam from his childhood has always an odd attachment towards technology and things he likes. He often and almost always holds onto things he owns. Some examples are the Faith of Heart, an outdated spacecraft, his sketchbook, some old earth rocks, and various other trinkets. He is often seen rescuing old outdated things because he develops an emotional attachment towards them. This attachment often grow to the point where he will put his life in the line to save it. Strives to keep the Sanctity Treaty as a peacekeeping force that doesn’t intervene in others conflicts or lets themselves be attacked. Upholds the Ideals and Principles of the Sanctity Treaty and tries to be a stern and emotionless leader in public. Always does his best to avoid conflicts. Tests his barriers and defenses, knowing they are unbreakable makes him happy. Doesn’t fight back when attacked, usually just sits back and takes it without defending. Always avoids conflict, despite needing to do so sometimes. Is stuck in the past and likes to retain elements and objects from long ago. Tends to test their opponent and let them attack first and a lot even if the battle or situation requires winning quickly. Doesn’t really do the friends thing. Only has about 3 over a 500 year span. Finds it extremely difficult to trust anyone. Is oblivious to emotions directed towards him that aren't anger. Using older forms of technology in combat. Prefers melee combat over ranged combat. Testing his defenses and weapons. 2007 - Meets a girl online and fall in love with the online girl despite dating Erik’s sister. 2009 - Arrives to find her dead. 2026 - Gets the Finis Virus, but is cured. 2035 - Is stationed at a USE military base to protect the colonies as people are transported to them from Earth. 2083 - Liam Savvik dies at the age of 95, before he dies his memories are downloaded and placed into the Gening body. 2090 - The first of many body upgrades is made. 2233 - has spent years living in the colony, as a military member. Is a captain of the Faith of Heart the entire time. 2300 after spending many years on the colony, he finally arrives at Aquire moon and helps Erik and others to write the Sanctity Treaty. 2305 - Liam heads out into the unknown to begin exploring the space around the Sanctity Treaty’s new territory. Two more partially habitable worlds are discovered. 2381 - a new body is built and Liam transfers himself to that one. This body uses exo suit technology. 2563 - the Soronian - Sanctity Treaty War begins, Liam is a captain and participates in the war despite being a Representative. 2570 - the war with the Soronian ends, Liam peacefully end the war after many losses and failed talks. He is re-elected as the Supreme Representative. 2671 - the Real Hologram System is used to make Liam a organic body with the benefits of a machine one. Due to his love for old technology, he chooses to keep the machine legs. 2692 -Liam gets his own personal Kydarin Crystal, a blue one, which is integrated into a sword called Banriu. 2846 - Liam enters the Tournament of Warriors, he makes it past preliminaries but loses to Erik in the first round. 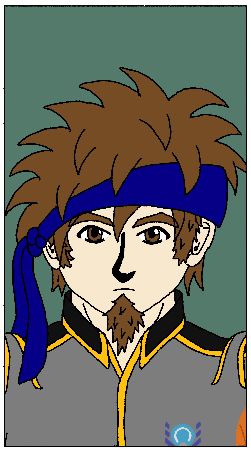 2851 - the second tournament begins, Liam enters, but is pulled into Vescrutia during a climatic battle against Mikio. A Kydarin Artifact forged in the heart of a Black Hole. It’s power yields an output of every star within 10,000 lightyears of the Crystal and is capable of housing that energy inside of it, in a realm known as the Void. Each Kydarin Crystal contains a Guardian Aia who protects and watches over the Kydarin Crystal, they stop the wrong people from accessing the immense energy of the Crystal. A Crystal can not leave it’s homeworld, as the link between the Crystal’s Aia and the World are strong and separating the two would render the planet were the Crystal comes from inhabitable without terraforming that world. Liam’s Blue Kydarin Crystal comes from a world that was destroyed, the Crystal was found floating in space among the ruins. Banriu is a two piece weapons that consists of an outer Shell, called the Shell Blade and an inner Core, called the Core Blade. While both are called Blades, they are actually quite different from that. Originally, the Banriu was the name given to the Core Blade. 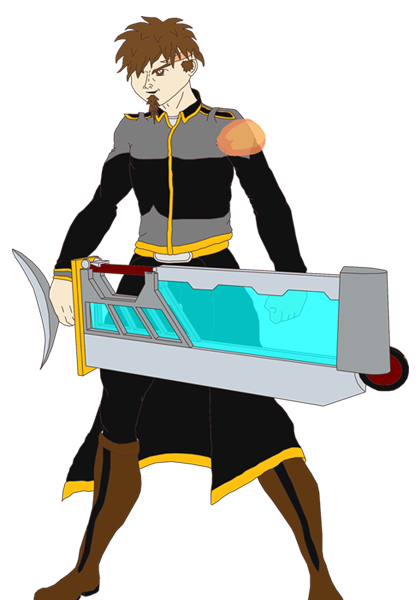 The Core Blade is a slab of Spiritual Ice, that has been given these properties by infusing Liam’s soul into it and in turn his spiritual and miniscule life energy into to the weapon. Spiritual Ice is a type of Ice that is unique in that it can not melt, no matter the temperature. The Ice acts more like a crystal rather than actual ice. The Core Blade possesses the ability to shoot out around 15 shards of Spiritual Ice at an opponent or at an opponent's attack or defense. If the Spiritual Ice shards are fired at an opponent's attack or defense, the ice shards, being possessed with Spiritual Power, have the ability to pass directly through the attack or defense, purifying the attack or defense and stopping it. This can only be done once before the Spiritual power in the ice is depleted, turning it to normal ice. The ice, after turning to normal ice, theshards can then continue on their journey to where it was intended to go. If fired at an opponent and it hits, the Spiritual Ice will cause metaphysical, ice-elemental damage to the opponent with a secondary effect of purification that uses the energy they encounter to backlash and nullify the attack they strike. If the ice shards use their spiritual power on an enemy attack or defense, then hit the enemy, they will deal physical, ice-elemental damage. The Cleaving Strike allows the Core Blade to cut through and purify things it comes into contact with. the Spiritual Jammer is the Core Blade’s ability to manifest Liam Savvik’s spiritual energy that is held within the Core into a dense anti-spiritual barrier. The Null Strike is passive ability that the Core Blade possess but can also be activated at will. Being possessed with spiritual power, the Null Strike feature allows the Core Blade to pass through an attack or defense. Unlike the Ice Shards the Null Strike does not nullify the target. After the Banriu’s forgery, Liam Savvik would construct a massive sheath for the blade called the Shell Blade. The Shell Blade was formed out of a large chunk of Starship plating, this plating was made for the use of space battleships, and as such is an extremely tough material. The Shell Blade also shares the same properties the Duranium Starship Plating does. The Shell Blade is made from an extremely dense material known as Duranium, Duranium is used to line starship hulls for protection in space warfare and was engineered specifically to resists massive damage yet be lightweight and easy to work with. To further strengthen the Shell Blade, Ablative Resin has been added. Ablative Resin is a type of coating that is applied to metals that allows the metals to take 1-10 direct hits from an attack and survive. This of course depends on the strength of the attack hitting the Ablative Resin. The Ablative Resin once hit will absorb the damage and spread it evenly across the coated surface. Ablative Resin is a naturally replenishable substance that once bonded with something, will always grow to its original bonded state. Thus, there is not a need to buy or make more. Real Hologram System Lvl 3 - It is always active unless deactivated. The Real Hologram System is a energy to matter transmutator. It is used to construct almost anything from energy. The thing that is created from energy must first be scanned and input into the Real Hologram Network. The Real Hologram System works by generating a hologram of what is desired by sensing the user's mind. The Hologram is then brought to reality by generating the needed matter/energy/forces to make it, which is easily found throughout the universe. The things needed to form the desired object are basically teleported and formed within a split second. For example, to create steak, the Real Hologram System would first form atoms of carbon, hydrogen, etc., then arrange them into amino acids, proteins, vitamins and cells, then put it all together into the form of a steak. In addition to forming things, the Real Hologram System can also break things down using the same principles it used to form them. the Real Hologram System is used automatically provide people and living beings with the essential nutrients and vitamins as well as medicines and treatments, thus eliminating the need to stock provisions and medical supplies. The Real Hologram System is also used to provide breathable air on ships and colonies (and to disassemble the carbon dioxide exhaled by the crew and people), thus providing an endless supply of oxygen and eliminating the need to carry air tanks or environmental suits. It can also generate forces such as gravity or anti gravity. The technology is also used for the automated repair of any Sanctity Treaty technology that is within range of an Imitor Sphere, which makes it possible to repair most ships damage without having to return to a space docks or colonies. Sanctity Treaty safety protocols prevent unauthorized replication of dangerous objects, such as weapons and poisonous substances. Replication of any medicine is restricted to medical personnel bearing a valid identification code and dna sequencing. By virtually eliminating material scarcity, the Real Hologram System plays an important role in the moneyless human economy within the Earth Alliance of Sanctity Treaty. Within the Sanctity Treaty are 4 Levels of people who can tap into the Real Hologram System. The first are Civilians. A Civilian can only use the Real Hologram System for recreational purposes. These are things like replicating food, generating toys, repairing household goods, or things of that nature. The Second are Soldier Operators. All Soldiers have their own personal Imitor Sphere, allowing them to act independently of an area not within the influence of a Sanctity Treaty Grand Imitor Sphere. Soldiers are capable of using a variety of things: like summoning weapons, healing, using elemental abilities, generating shields and other things a soldier might be able to do. A Construct Operator is an individual who can use the Real Hologram System to potential. Only a select few can use the Real Hologram System to its full potential. These select individuals are:. Erik Miller, Liam Savvikl, Abraham Revil, and FAITH. An Imitor Sphere allows it’s Operator to make use of and connect to the Real Hologram Network. An Imitor Sphere is an Energy Conduit that is connected to any nearby Kydarin Crystal or Node. The connection between the Kydarin Crystal/Node and the Imitor Sphere is “wireless” and energy transfer is only limited by whether or not the user of the Imitor Sphere is within the range of the Kydarin Crystal or Node. The Range of an Imitor Sphere is usually 3 light years. A Node is the result of attempting to replicate a Kydarin Crystal using the Real Hologram System. The resulting object looks and feels like a Kydarin Crystal however, it can not draw from the stars. Instead it draws power from a Kydarin Crystal directly. Nodes are used to extend the range of the Real Hologram Network beyond that of the range of a Kydarin Crystal itself. Notes are often protected by massive lead pillars that are coloured black with carbon. the Holographic Universal Display System or HUDS is designed to interface with a Civilian or Soldiers eye’s. For a Civilian the HUDS is nothing more that what a Smartphone, or VR System is for a human today. For a soldier the HUDS is a vital piece of equipment used for a large variety of things in and out of the battlefield. The HUDS aside from acting as a soldier's eyes, also acts as a separate brain. This allows the soldier using it to perform multiple tasks simultaneously, which a normal human could not normally do. It also shares data with other HUD’s allowing all soldiers to have a better understanding of a battlefield or mission. Optical Telescopic View is a visual digital magnification system that can focus and magnify images up to 144,000 meters away. Radar is an object-detection system that uses electromagnetic wavesspecifically radio wavesto identify the range, altitude, direction, and speed of both moving and fixed objects such as aircraft, ships, spacecraft, guided missiles, motor vehicles, weather formations, terrain, magical abilities, elemental attack and more. the soldierKs HUDS transmits pulses of elector-magnetic which bounce off any "object" in their path. The "object" returns a tiny part of the wave's energy to the soldier's HUDS. Laser range gated imaging is a form of active night vision which utilises a high powered pulsed light source for illumination and imaging. Range gating is a technique which controls the laser pulses in conjunction with the speed of the detectors. The detector integrates the light pulses to form an image. Thermal imaging perceives thermal radiation and does not need a source of illumination. It produces an image even in the darkest of nights and can see through light fog, rain, illusions, magic, dust and smoke. Thermal imaging makes even the smallest of temperature differences is visible. X-rays are like light in that they are electromagnetic waves, but they are a higher frequency and lower wavelength so they can penetrate many materials to varying degrees. Since human, rocks, steel and other masses all absorb X-rays at different levels, the data transmitted to the HUDS virtually allows the soldier to see through objects. The Sub-Quantum analyzer is a system that is used to analyse energy, life, atom, matter, soul and all the things that make up the universe. It does this by sending out Seltron Waves. Seltron Waves are a higher form of gamma radiation that does not have an effect on anything and can not be detected without a Sub-Quantum Analyzer. Seltron Waves work by being transmitted from the HUDS, bouncing relentlessly off objects then quickly returning to the source where the data collected is analysed by the HUDS. This means that the soldier is able to see things not visible to the naked eye as well as see things far off. It also vastly improves his HUDS' other views. Using all the data from all the other types of visions the HUD can filter out things, such as walls or smoke so that they appear as gone when needed. This also works for holograms and illusions. The Tachyon Accelerator Beta is a system of connected Wings, Imitor Spheres and Nodes that allows the user to tap into a Kydarin Crystal’s energy for up to 8 times the additional power draw and output. This causes the power of the user to be amplified by 8 as opposed to the standard 1 a normal Soldier using a single Imitor Sphere would have. This type of power boost, even benefits a Construct who normally has complete control over the RHS. The Tachyon Accelerator is the second of two prototype Eximus Systems. The first being the Tachyon Accelerator Alpha, or the Wings of Bereavement. Where the Wing’s of Bereavement only amplified power and energy draw, the Tachyon Accelerator like it’s name suggests outputs massive amounts of Acceleration. As long as the Tachyon Accelerator is active it’s user’s speed infinitely grows at a rate of 50KM per hour, per every 5 seconds. An instant boost is attained when they are activated allowing speeds of up to 500km/ph. The Spatial Disruption Barrier is a barrier that has the power and attributes of all Liam Savvik’s other shields, except it draws much less power as it only has to generate one shield instead of multiple others. The Tachyon Accelerator has the ability to Quantize. This is literally its own form of teleportation. It does this by jumping into Slipstreams. Slipstreams are a contained dimension where time inside Slipstream moves at a normal rate, but time outside it moves at fraction of a millisecond. Almost always, Quantizing it used to travel from point a to point b.
Funnels are the Tachyon Accelerators’ Wings. Each Funnel in addition to containing it’s own Node allowing each Wing to independently act and work on it's own Is also a sentient system that is linked to the user. Each Funnel has extreme speed, and usually fires projectiles or beams. Funnels also have the ability to create a beam shield large enough to surround either the Funnels themselves or when linked, create large barriers. Each Funnel is also capable of Quantizing. Each Funnel is capable firing various types of beams. The Nautilus Energy Beam was created for use specifically underwater. The Nautilus beam is a beam of pure sound waves. When fired they strike a target causing massive vibrations that can vibrate it apart. Pulse Cannons are concentrated blasts of raw energy fired like bullets. The Pulse 2 Upgrade is an upgrade to the Pulse Cannon. This upgrade allows the Pulse Cannons bullets to arc and curve towards their target. The Photon Cannon is a very simple weapon. It works by gathering photons from any source of light and storing them inside a chamber. When the desired amount of photons is reached the shutter opens and the photons release in a beam that can be altered. These alterations can go from a wide spread out style attack to a tiny concentrated beam. The Photon Cannon was and still is a success because of its quick firing rate and the speed of the beam created when releasing the photons. The Phase 2 Upgrade is an Upgrade to the Photon Cannon it allows the beams of the Photon Cannon to teleport allowing for guaranteed strikes to the target. Positron Cannons are highly powerful weapons used as the main guns of some large warships. They fire beams of positrons, the antimatter equivalent of electrons. When such a beam comes into contact with an object, the positrons and electrons annihilate each other, which in turn causes the target to break apart on a molecular level. Radion even in small amounts,tears apart living tissue almost instantly at a molecular level, and even has the ability to tear apart at non-living molecules. Its properties also allow its range and area of effect to be precisely controlled, from encompassing a single room to engulfing an entire planet. Its massive destructive potential was and still is the most effective weapon against the South Syndicate. Plasma is a superheated ionized gas that once contained can be unleashes and guided in any direction in the form of a single bolt, beam, or continuous stream. Data Link Mode is a system that temporarily removes all limiters the Kydarin Crystal and the User has. When this limiter is removed, the Kydarin Crystal’s energy and the user become one, allowing the user to funnel and use as much energy as the Kydarin Crystal can provide. However, this boost in performance and power is only temporary and after a short period the Tachyon Accelerator must disperse and cooldown causing the Tachyon Accelerator to lose functionality for a long period of time. Liam Savvik is capable of using his Funnels to created closed spaces, or isolated dimensions. The Positron Shields works by releasing a field of positrons, which are the antimatter equivalent of electrons. When something comes into contact with the field the positrons and electrons annihilate each other, which in turn causes the attack to break apart on a molecular level. The Graviton Field emits a complex phase variance of Gravitons similar to a black hole but in the opposite direction in order to create a gravimetric distortion. This literally creates a tear in the fabric of space pushing away anything that comes into contact with it using intense gravity. This type of shielding will not stop quick moving objects propelled by immense forces. The Variable Interference Field or I-Field for short is a system developed by the Sanctity Rising Nation division. The Variable Interface Field is designed to reduce the damage caused by physical attacks. It does this as soon as the opponent's physical attack comes in contact with the constantly active field of variable interference that is around 6 centimetres away from the ship's hull, building's wall, fighters or personnel at all times. When the attack nears the outside of the Variable Interference Field the Field then generates thousands of carbon molecules so dense that the attack is reduced or in some cases stopped. This however does not stop energy based attacks. A variant of the Energy Jammer was later developed by Liam Savvik on specifically for Vescrutia and Kwandrivia. Working of the same basic system as the Energy Jammer the Magic Jammer is meant to stop Magical attacks. The Mind Jammer is a barrier meant to ward off mental attacks, mind reading and other mental based things. The Faraday Shield is an enclosed conducting shell that is used to protect him against electrical and magnetic attacks. It is composed of million of atomic level particles bound together using his real hologram system and can be summoned just like any of his other shields. The Faraday Shield has no electric or magnetic field inside, even when placed in a very strong external electric field or electromagnetic Field because the charges on the conducting surface rearrange themselves until the electric field or electromagnetic inside is negated. the Faraday Shield also works in reverse. If there is a strong electric field or electromagnetic Field inside, the field outside the cage will be negated. This shielding effect causes The Faraday Shield to act as a shield for strong electric fields or electromagnetic fields. In addition electromagnetic waves consist of oscillating electric and magnetic fields. Therefore Faraday cages effectively shields against electromagnetic waves or electromagnetic radiation as long as the holes in the wire mesh are significantly smaller than the wavelength of the electromagnetic waves. The Total Rackup 011 is a shielding system completely developed for use after Liam Savvik arrived on Vescrutia and Escellsia. Because his barriers and shields were built to fight against guns and conventional weaponry they often failed Liam Savvik in the tough battles and fights of Vescrutia and Escellsia. Using his knowledge of both worlds Liam Savvik would make the Total Rackup 011 or TR011. the TR011 once activated can only remain operation if something once again strikes it. After something strikes the shield, something again must strike it within 2 second or the shield fails and drops. If something does strike the shield before it drops the shield then gets stronger. If something manages to continuously strike the shield it does not weaken, it only becomes stronger and stronger. This is why Liam Savvik named it the Troll Shield. [spoiler]The Vernier Launch Legs are the only mechanical part left of Liam Savvik. As he upgraded himself he chose to leave his legs in the classical hydraulic and motors fashion rather than upgrading to the newer technologies. The Launch Legs have basic features that allow Liam Savvik to attain speeds of running up to 100 kilometers per hour and temporary sustained flight for 12 seconds of speed ranging from 140 km per hour to 180 km per hour. After the 12 second burst a 6 second recharge and cool down period is needed. One that wouldn't be necessary if he would have upgraded his legs. A unique feature about these is that they provide nearly instant velocity and can propel Liam Savvik to 180 km per hour in 0.01 seconds. The Vernier Launch Legs flight and control systems are all monitored and run by a system known a ABASS. This allows for the speed, pressure, surface pressure and all the necessary calibration to be made for walking or flying in certain conditions. Such as Snow, Sand, Ice, Rain ect. The Vernier Jumpjets are located in various spot that each hold their own special purpose, these locations are: The inside of each leg at the calf and push out of the legs when in use. These Vernier are responsible for maneuvering forwards and backwards along with moving upwards they are the least important of the 3 sets. Without these 3 active the flight speed would be 140 kilometers per hour and with them is increases to 180 kilometres per hour. The next set is located in the shoulder blades of Liam Savvik. These Verniers are responsible for the main upwards and forwards thrust of Liam Savvik they are the primary Verniers responsible for Liam Savvik speed and power. The final set of Verniers are located within the bottom of his feet. These Verniers act as stabilisers and additional thrust when flying. Speed is increased by 60km per hour each rank. Originally a Kulazian ability called the Gravity Well, the Gravity Well was reverse engineered by the Sanctity Treaty to create the Gravemetric Torpedo. The Gravimetric Torpedo is launched towards a target and upon hitting the target it breaks emitting a complex phase variance of gravitons similar to a black hole in order to create a gravimetric distortion. This literally creates a tear in the fabric of space pulling in anything around it towards its intense gravity. The effect radius is around 4.6 meters and it lasts for 10 seconds. The Sadash is a basic Psionic attack that the scientists of the Sanctity Treaty discovered how to use after studying Newtypes. The Sadash is a limited use Psionic blast that is almost always shaped like a missile. The Shadash when used, forces anyone hit by the blast radius to attack the one who used the Shadash for 5 seconds. For this reason it was kept as a military weapon and the way it is performed has been locked away and kept secret. The Shadash was and has never been used in military or civilian applications. As the dawn of antimatter weaponry hit the Sanctity Treaty it was of the utmost priority to duplicate the famous Photon Torpedos of the 1960's television show Star Trek and because of this the Photon Missile was born. A Photon Missile is an antimatter warhead. When fired, Photon Missiles appear as a spiney ball of white or yellow energy. A Photon Missile spreads it damage over the surface of its target evenly. A Positron Missile is one that explodes sending beams of positrons, the antimatter equivalent of electrons outwards from the center the explosion. When such a beam comes into contact with an object, the positrons and electrons annihilate each other, which in turn causes the target to break apart on a molecular level. This is a basic missiles that has a hard protective casing filled with explosive powder and shrapnel. It is fire at the opponent and can be remotely or impact detonated. It can also be set to detonate when something comes within 5 centimeters of it. It explodes usually sending a non elemental explosion 2 meters out from the center and the shrapnel 10 meters. A Phase To and Spreader Upgrade is available, each upgrade can be stacked. Phase To Upgrade is an upgrade to the standard Explosive Missile. The Phase To Upgrade allows the Explosive Missile to phase in and out of normal space by distorting it, allowing it to pass through armoured hulls and damage the interior of the target Though quite dangerous, they were quickly rendered obsolete as the Sanctity Treaty began its push into the development of positron and quantum shielding technologies. The Spreader Upgrade is another upgrade to the standard explosive Missile. When a Spreader Upgrade is applied to the Explosive Missile the missile will act as normal Explosive Missile. When the Missile nears it's target it will separate into 3 separate smaller missiles that each have the same explosive potential as a hand grenade. Neural Disruptors block neuromuscular transmission at the neuromuscular junctions, causing paralysis of the affected muscles. This is accomplished by the use of neural disrupting signals that affect the receptors of the motor nerve end-plate. The Neural Disruptor detonates close to or on a target sending the signals into the body of the target causing the effect to occur. This effect is designed to last for around 10 seconds on humans and 6 on other life forms. The Hammerhead Missile is a missile that is made from a lightweight yet extremely durable metal known as Duranium. This thick steel missile is meant for ramming through defenses and other attacks. It deals heavy blunt damage, is hard to take out and can be used as a shield for other missiles or Liam Savvik himself. After its success with Liam Savvik, the Hammerhead Missile was scaled up for ship and mech suit combat. Developed for use in the late 21st century the Micro-Nuclear Missile was an American spin off of a Russian hand held Nuke Launcher. It works by simply splitting hydrogen atoms forming a nuclear blast that is around the size of the standard explosive missile. Unlike traditions Nuclear Warheads this one has been upgraded so that it does not give off radiation. The Anti Beam Depth Charge is a Missile that detonates into a cloud of energy absorbent Rubidium particles that can be used to stop incoming attacks from energy weapons it does this by absorbing the energy from the attack, reacting with that energy and then dispersing that energy around making it harmless. The Rubidium Particles do have a weakness. Upon contact with water they oxidize at such a rate explosions occur. Meaning they don't work well near water. The Metaphysical Energy Missile is a missile that upon hitting the target detonates, generating a 1.5 meter sphere of metaphysical energy that expands from the point of detonation, passing through anything in its path. Expansion speed is around the speed of sound. It deals flat-rate damage meaning this attack has a property that causes it to damage evenly whether the attack hits from the centerpoint or barely nicks the target. The damaged caused by the MEMs does not take into account weak points or tough points, but hits any part of the body evenly. It detonates either by remote detonation or impact detonation. A Ether Shot Upgrade is available. The Ether Shot Upgrade is an upgrade to the standard Metaphysical Energy Missile. The Ether Shot Upgrade allows the M.E.M. To expel all of it's energy in a beam at any given time to fire it at the target. The Ether Shot has the same effect as the M.E.M. The Splitter Missile is 10 small Duranium spikes that are housed inside the shell of what looks like an ordinary Explosive Missile. When the Splitter Missile is fired at the opponent and misses the Splitter Missile will stop and turn in the opponent's direction and fire the spikes with great speed. If the Splitter Missile makes contact with the opponent the spikes inside will be forced into the opponent's body. Each spike is roughly the side of a Sharpie Marker. The Splitter Missile has advanced sensor that warns it of oncoming attacks allowing it to self detonate before being destroyed. A Spiker Upgrade is available. The Spiker Upgrade is an upgrade to the Splitter Missile that causes the homing spikes of the Missile to become highly reactive with the air as soon as the spikes are released from the Splitter Missile casing. This causes them to be red hot and grants them more piercing power. The amount of Spikes is decreased from 10 to 4 to make up for a size difference. Liam Savvik is a being known as a Construct. Constructs are being that have complete mastery over the Real Hologram System. Complete Mastery grants the Construct the ability to manipulate matter, energy, force, anti-matter and various other supernatural forces at will. Such manipulation is only capable by fully utilizing the Real Hologram System. Being a Construct Also makes Liam Savvik a Multiversal Singularity. This means that there only is and ever will be one Liam Savvik, unless Liam Savvik himself deems there to be more, Example: While in Data-Link mode other versions of Liam Savvik are forced into other realities, dimensions, timelines... ect. Being a Multiversal Singularity also allows Liam Savvik to traverse all forms of dimensions freely. After seeing King Erik and William's ability to Ascend and use Ki, Liam Savvik became hell bent on doing the same. It wasn't until after Liam Savvik studied Erik's Ascension that Liam Savvik finally was able to Ascend... or so he thought... Liam Savvik driven by his insane desire to Ascend would become tainted with this insanity and instead of ascending he would False Ascend through madness and insanity rather than emotion and desire as King Erik and William did. While attaining False Ascension did what Liam Savvik wanted to it also rendered all of his technology useless thanks to the Real Hologram System becoming corrupted with the insanity the False Ascension form granted Liam Savvik. The False Ascension manifests itself as a massive red upwards flame-like aura of flowing energy that appears to generate from Liam Savvik's usually dormant life energy network. This makes it the ONLY ability Liam Savvik possess that uses his OWN natural life energy to use. Liam Savvik's False Ascension can only be used with extreme passion, anger or at the point of death. In this form Liam Savvik takes on the appearance of a winged angel, his legs, break off and become human, his near death wounds heal themselves and he becomes purely human, without any technological features. While Liam Savvik is in False Ascension, Liam Savvik is surrounded by a massive aura of compressing force that is always crushing at his body. This force also causes anything that comes into the aura to be subjected to this crushing force. Disintegration is a passive The Aura gives off, it cause anything that cones inside of it to be subject to a matter, energy, force and supernatural consuming power that makes it so getting caught inside the aura would be deadly. Things caught within the aura are gradually drained of what ever power them. On top of that, matter that has been broken down by Disintegration is converted to power for the Aura. Each punch, kick, or physical strike that is made while using the Aura is followed by a massive shotgun style blast of the Aura that moves at supersonic speeds. Thanks to the False Ascension Liam Savvik is gifted with strength, while not as strong as even normal King Erik, Liam Savvik is still considerably strong. While not as fast as while he wore the Tachyon Accelerator Liam Savvik is still fast. Spiritual ki/life energy/chi is the natural energies that flow through our bodies in a network of channels. Elemental Material Ki is a basic form of spiritual ki found coursing through the bodies of all living beings. When channeled in the right ways this ki can be used to form Elemental Material Ki attacks that have the properties of any element they are infused with. When the Elemental Material Ki becomes infused with it's elemental attribute it acts as the element but does not show signs of it being so. So if one tried to scan or manipulate it they would always see or feel it as basic spiritual ki. Th amount of damage is based on the attacker's magic effectiveness and the defenders magic resistance. Upon hitting the defender the Elemental Material Ki will disperse across the defenders body acting like metaphysical damage but with one difference, the point where the attack hits is where the most damage occurs. Raw Material Ki is the ability to expel one's own spiritual ki in the form of balls or beams of crackling energy. This is different from Elemental Material Ki in the way that it does not embed itself with elemental properties. The balls cause less damage, fire faster and can be spammed, the beams fire slow, move slower and cause greater damage. Organic Material Ki allows Liam Savvik to generate and regenerate living tissue, organs and body parts including nerves. Natural material Ki allows the Genera to generate and grow plant life. Soul Material Ki is a type of spiritual ki that allows the user to transfer a portion of their soul into a physical object to animate that object into performing the will of the one who transferred it. This ability only works on something that is non living and that does not already have soul or soul Ki flowing through it. Construction Material Ki is the ability to transmute other carbon based substances into another substance of the users will. This is like Soul Material Ki in the way that it reforms things. However this Ki form does not embed the users soul into the object. This allows for the more risky attacks and defenses to be used. Bio-Destruction Material Ki is the same as Destruction Material Ki only that it works on living things. This has enough power to seriously damage a lower ranking opponent but costs a lot of Ki to use. Mental Material Ki allows Liam Savvik to directly attack the targets soul, doing so causes the target to move slower and have less of a reaction speed, making them easier to hit and such. Space and Time Material Ki allows Liam Savvik to use his Ki for warping and bending time and reality, for things like temporal wakes and portals. These are attacks that use one type of Ki but are much stronger than normal due to their high Ki output. This a charged shot of Raw Material Ki that fires out in a 1 meter wide beam of dense Ki that grows infinitly stronger the longer Liam Savvik fires the beam. Fusion is a combination of Organic Material Ki, Mental Material Ki and Soul Material Ki. Fusion allows Liam Savvik to fuse organic and living creatures together. Once together the two minds, bodies, abilities, ki/life energy and souls become one and a new warrior is formed. Buster Cannon is a combination of Raw Material Ki and Destruction Material Ki. It has the ability to completely ignore defenses and shields, living defenses and weapons and damage the opponent. Imperial Buster Cannon is a combination of Elemental Material Ki and Destruction Material Ki. It is meant as the same style attack as the Buster cannon but can be embedded with Elements for an added elemental effect. Decimation Disk is a combination of Elemental Material Ki, Bio-Destruction Ki and Soul Material Ki. It forms a razor thin disk meant for slicing and dicing, it also has a homing effect controlled by Liam Savvik. Multiform is a combination of Organic Material Ki, Mental Material Ki and Soul Material Ki, it allows Liam Savvik to create up to 4 clones of himself, but cause his power to be divided evenly between the 4 clones. Supreme Imperial Buster Cannon is a combination of Raw Material Ki, Elemental Material Ki, Destruction Material Ki and Bio-Destruction Material Ki. It is the ultimate attack in terms of offensive. It has the power to critically damage an opponent ignoring all defenses. 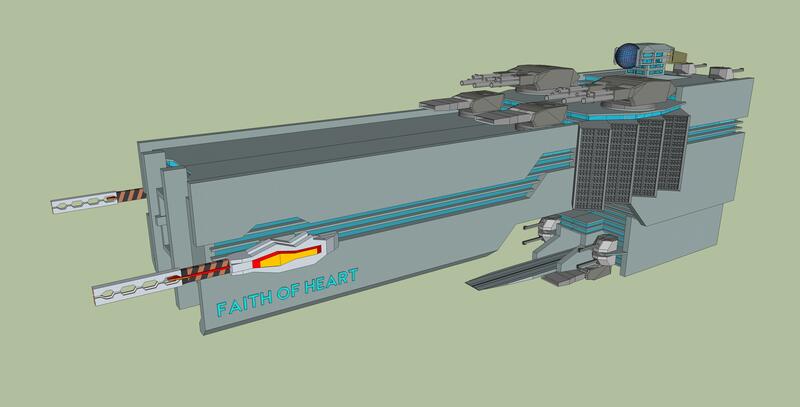 FAITH is a AI that was originally designed to guide and control the ship. Since then she has become sentient and can occasionally inhabit a body built for her. She remain on the ship when Liam is not there to manage it. While the Faith of Heart has a Real Hologram system, Liam chooses to stick with conventional weapons that use the RHS to fire and generate ammunition. Hanger - Originally a Mecha hanger, it is now the hanger for Soldiers before they launch. Last edited by Liam Savvik on Fri Jan 25, 2019 9:37 am, edited 10 times in total.